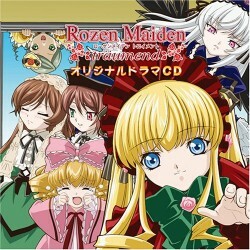 On February 22 of 2006, a drama CD was released for the Rozen Maiden Träumend TV series. This can be thought of as an audio-only full-length episode in two parts (including the same opening and ending theme songs as the TV series), followed by three short comedy side stories. It seems to take place sometime between episodes 6 and 7 of the TV series. However, there is no real connection to the TV series plot, and parts of it may be considered as containing very mild spoilers for the end of the series, so it is probably best listened to after episode 12. Below you can find a translated script for the audio tracks on this drama CD. Unfortunately, you will not find on this web site the actual audio content itself. You must either purchase it from an import CD store, or otherwise obtain it from (ahem) the "usual sources" on the internet. Having done that, you can listen to it in your audio player of choice while following along with the script. There are numerous approximate timestamps and audio cues (sound effects, start and stop of background music pieces, etc.) included to help you keep your place as you listen. The translation can be found here both in HTML for each track, as well as a full ASCII script that you can download (right-click and "Save As...") to use however you like offline. I didn't think it necessary to translate the theme song lyrics, since you've doubtless heard them many times before. I recommend that you consult one of the many fansubs of the series if you have a burning need to know the words to these songs. Download a plain ASCII version (*.TXT) of the entire script here (38 KB).